In the photo above is a very spacious traditional style kitchen with a contemporary update brings together both contemporary and classic styles. 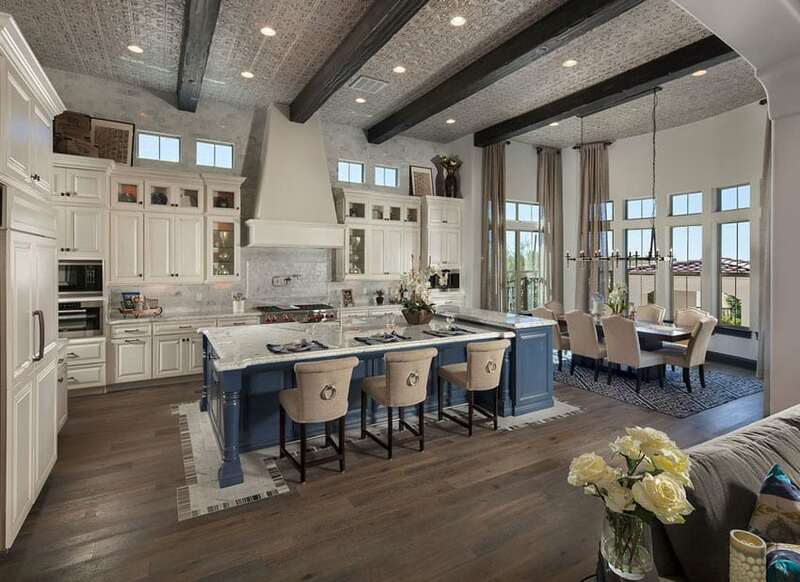 The traditional style kitchen cabinets in light cream comprises the main kitchen cabinets, while the massive kitchen island adapts a bold cobalt blue finish. All counters are topped with a slab of marble for an elegant touch, while the walls of the kitchen are clad with marble subway tiles. The ceiling with exposed wooden beams is also interesting as it uses a textured wallpaper instead of a plain paint finish. 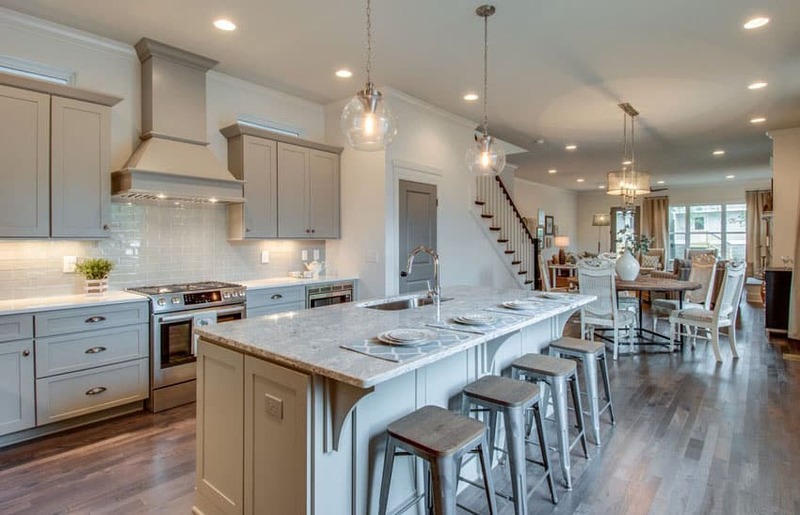 Many homeowners these days are looking for open concept kitchens that can bring the entire family together and allow for easy entertaining and conversation. One of the great things about an open concept kitchen design is that even small kitchens can feel larger with an open layout. 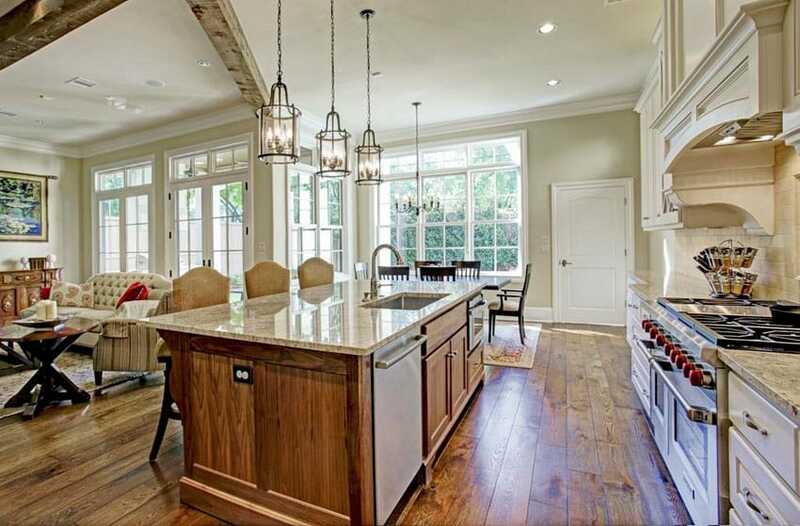 Here are some of the best benefits of an open kitchen layout. A mixture of contemporary and classic, this kitchen is sure to bring that classic beauty to any modern space. Ash oak engineered wood floors and off-white painted walls set a soft neutral mood to the entire interior, while the flat white of the kitchen cabinets definitely pops out. The main cabinets uses black soapstone & white subway tiles for its countertop and backsplash respectively, while the large kitchen island uses white soapstone instead. What’s more trendy and functional all at the same time is to have an open style kitchen that ease accessibility and merge the whole space dramatically. There are a variety of trends that an open style kitchen can be adopted accordingly to suit your desire, maintaining the functionality to match the existing aesthetic of the home. 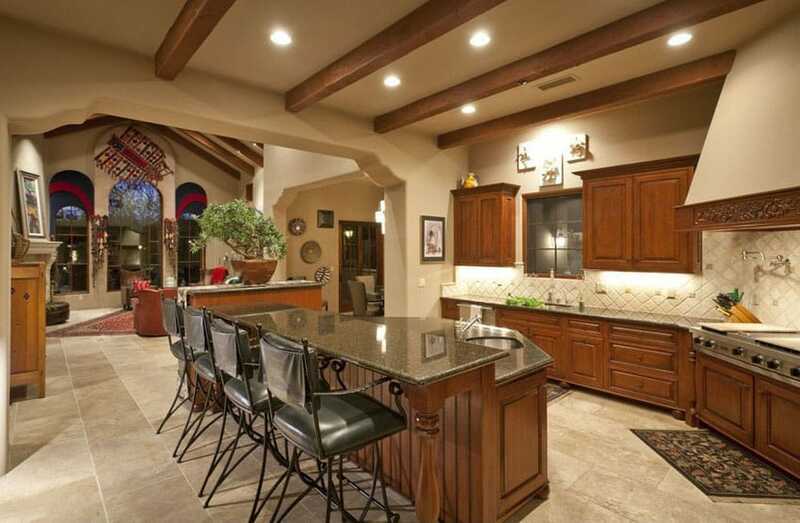 Single Wall open kitchens usually bears a set of cabinetry on one side allowing ease of circulation and space serving. The storing and food preparing happens on the side of the single wall creating an expansive view of the open kitchen space overall. Single wall cabinetry including a sink addresses a more compact layout of the work triangle which is between the refrigerator, store and the sink. A kitchen island on the other hand functions as a storage space, food preparation area and a dining space while minimizing furniture, yet creating a collaborative view of the whole kitchen interior. If a Kitchen Island doesn’t seem like the ideal solution for your space, there is always an option to shape the open kitchen with an additional table or peninsula that serves the purpose. The idea of having an open kitchen is another reason that guests feel comfortable not leaving the living or the dining room. This is especially useful for those wanting to keep an eye on young children, spending more time with family members or for entertaining guests. 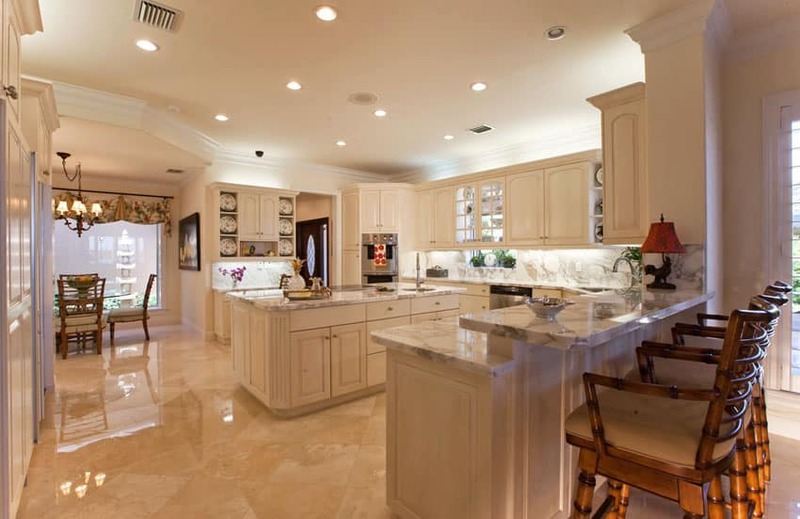 Some open kitchen spaces are divided considering the wet and dry areas of a kitchen. As a solution for the emerging problem many homeowners extend the tabletop to the living room or the dining that prevents the problem. The extended tabletops or the kitchen islands could be easily converted into a mini bar area with an addition of few bar stools to fit your need. Installing open ledges instead of closed cabinetry are a modern approach that many of the homeowners adopt to. 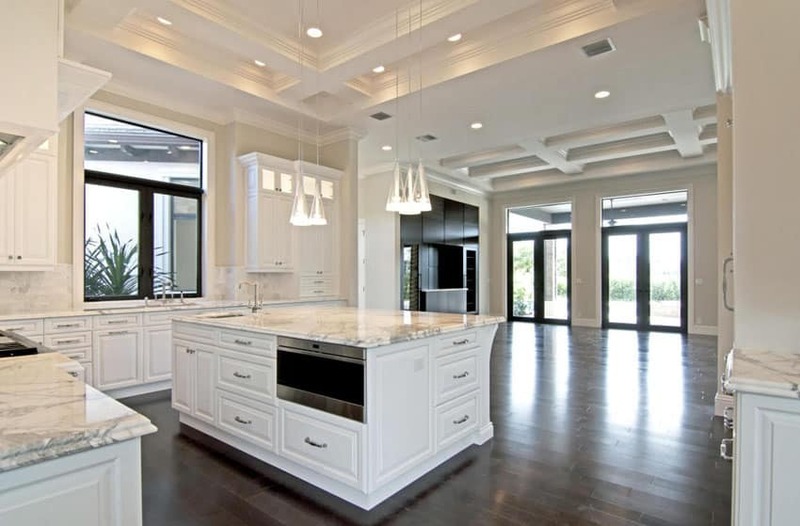 Open concept kitchens and the rest of the home areas can be designed to be easily merged, when in doubt separating the areas with an object such as a couch or a rug or in terms of lighting, placing a large chandelier or an existing interior feature such as an attached wall are options at hand. 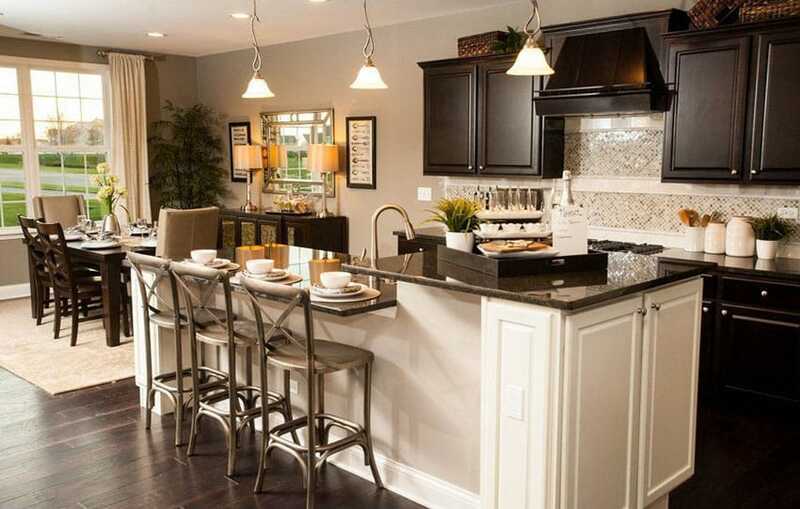 The open concept kitchen’s aesthetic are of vital importance. 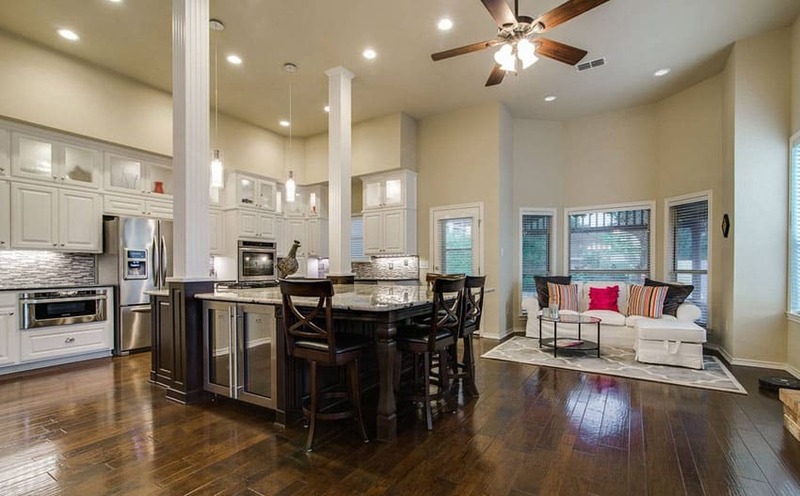 The lighting, color palette, flooring are some aspects that needs to be addressed sensitively. The most interesting feature of open spaces is the unobstructed view that is visible from one end to the other. This helps to maintain a regular aesthetic throughout the home by merging the open concept kitchen within the entire household. Considering certain situations, designs range in tow island kitchens that comprises of a work triangle for both islands. Even though open kitchen spaces lack privacy the modern day world where gender roles are neutralized demands an open kitchen. The interaction provoking layout is a wise strategy to be used in modern day household. The smell of the open space kitchen can be a real practical problem. The problem can be solved by installing a half wall with a glass partitioning on top that functions as an open kitchen all at the same time. 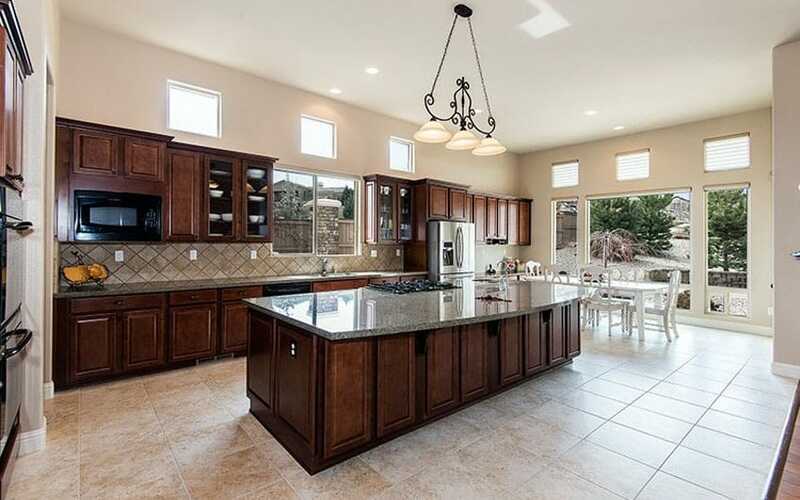 Open concept kitchens have their own pros and cons. For instance ease of accessibility and circulation are positive attributes of having an open space layout. Encouraging communication and an expanded view of the whole house lists under the advantages that is a result of minimalist walls. The ease of storage and space management is of vital importance to any household. The aesthetic that it carries with a modern, sleek appearance are interesting elements that adds up to the design of the house. Even though the open kitchen had been designed in a particular way that lacks privacy the pros are definitely at advantage to dedicate a space of the house for an open kitchen. A industrial-inspired kitchen with excellent combination of dark and light colors. Beige walls provide a nice neutral background for the wengue-stained kitchen cabinets. This is paired with turquoise countertops for that bold pop of color and stainless-steel finish kitchen island. The combination is unique and definitely brings out a polished industrial style vibe. An open transitional style kitchen, this time using oatmeal painted kitchen cabinets to match with the pale yellow/cream walls. These colors, along with the ash wood floors and the light yellow glass subway tiles make a nice and soft color scheme, creating a feminine and elegant look. This lovely open design kitchen features a floor plan that includes a designated living room area that shares space with a living room area. 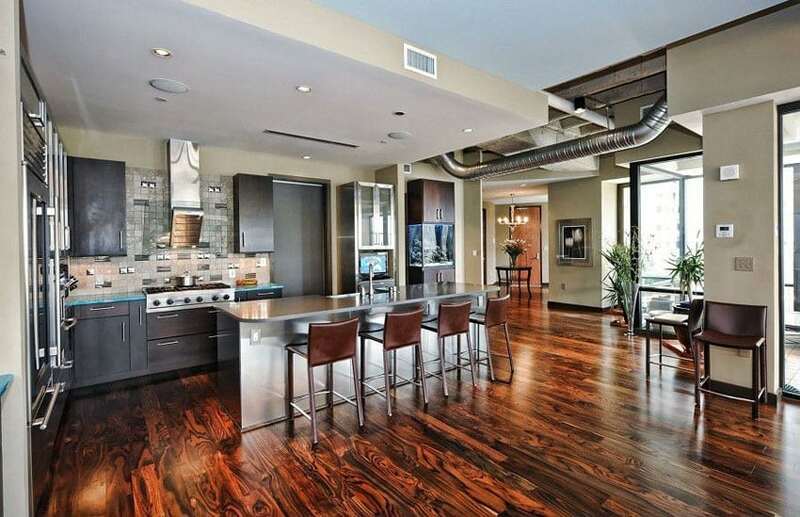 Hardwood flooring is carried throughout the space along with a wood plank ceiling with exposed beams. Another contemporary take on classic style kitchen, using simple paneled cabinets in a combination of white and gray, making a timeless, gender-neutral space. 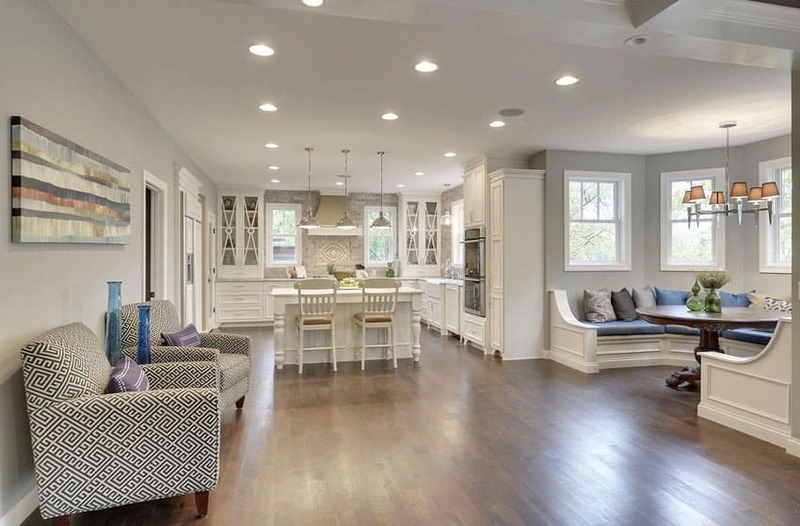 The open layout directly connects it to the dining and living area, but because of the excellent choice of finishes for the kitchen, it can easily match whatever style the other areas of the house adapts. This elegant neo-classic style kitchen space matches with the rest of the contemporary neo-classic furniture pieces in the home. The layout of this open kitchen is unique, in which it occupies 2 parallel walls for the main cabinets, while the dining area is placed right in between the two cabinets, as there is a large floor space available. The main kitchen cabinets uses a cream paint finish with marble top, while the kitchen islands goes for a darker wengue finish with the same marble top. 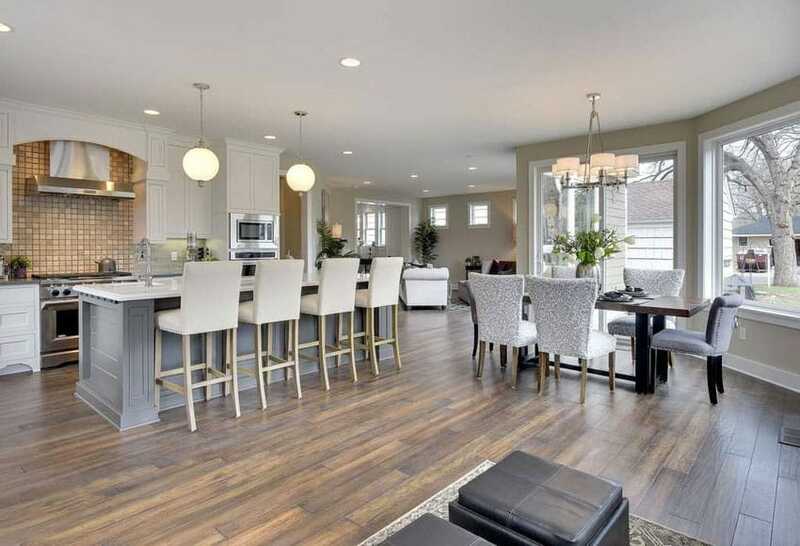 Open concept kitchens are highly sought after for those who enjoy entertaining and casual family living. The interiors of this kitchen space is composed of mostly white Calacatta Colorado marble countertop, making it look crisp and clean. The kitchen cabinets also uses the same flat white color and matching white subway tiles for the backsplash to match with the general look of the interiors. To add little bit more variety and contrast, the kitchen island uses Mahogany finish, making it stand out from the rest of the other white surfaces, but without upstaging other elements of the kitchen. The large breakfast bar is an inviting place to eat or help prepare food, while the bright window seat bench is another little touch that adds a lot of personality and charm to the room. 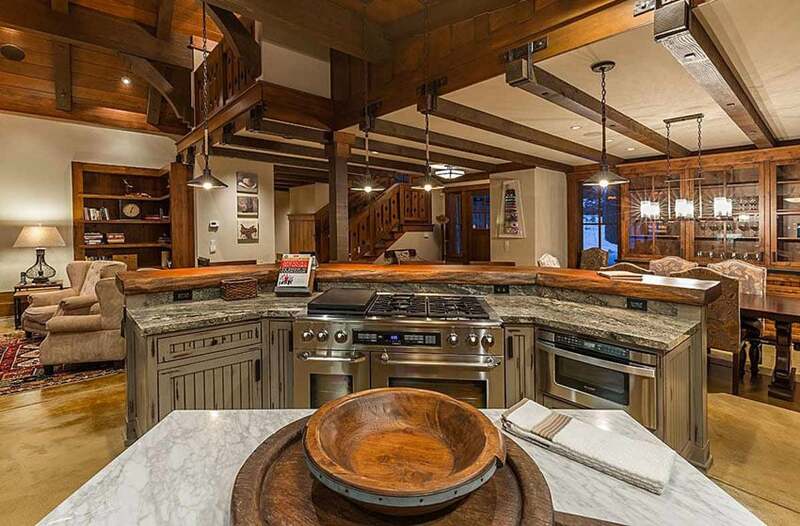 This rustic style kitchen has a very strategic location, having excellent vantage point to both the dining and the living areas as it is placed in the corner. This allows you to work on the kitchen and the same time, accommodate/entertain guests whether they are in the dining or in the living room, or both. 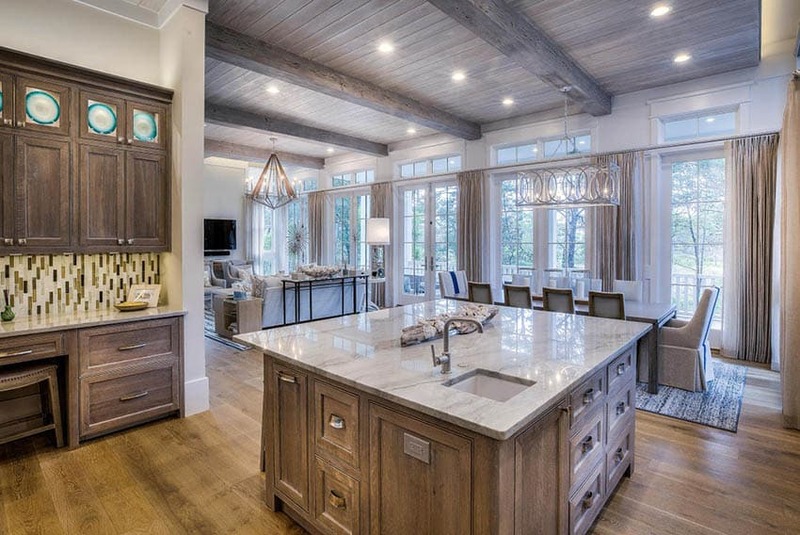 Since the architecture has a rustic country appeal, the kitchen also follows, adapting a weathered beige paint finish for the base cabinets with a solid wood slab bar counter top and granite counter top for the corner island. A contemporary French style interior with a nice open layout adapts an all-white scheme for its small open kitchen. Contemporary panel detailing and leg turning details are applied in the kitchen cabinets and island, giving it that authentic classic French country vibe. A cozy breakfast nook with colorful cushions is tucked in to a corner of the room which offers a great place to sit, eat and socialize. A transitional style open kitchen with classic design inspiration adapts a combination of wengue and white finish for its kitchen cabinets. The main cabinets uses wengue finish with beige granite top, while the 2-level kitchen island uses white base with the same beige granite top. The combination of finishes gives this small kitchen a modern update, along with the use of metal bar stools and modern lighting fixtures. 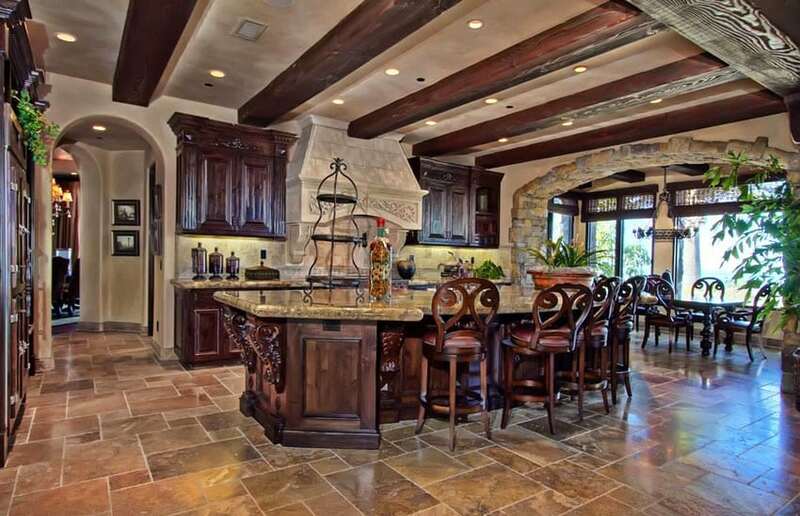 Some traditional kitchen island designs such as this example, can be on the “heavier” side, using large and thick solid materials and details. The open layout of this kitchen helps tone down this “heavy” look, so despite of its use of large blocks and slabs of stones and dark oak wood cabinets and furniture, it still manages to look bright and light. This modern transitional style kitchen uses classic solid mahogany kitchen cabinets and combines it with the more modern gray granite counters, for a more interesting look. This kitchen is directly connected to the dining area, and has large windows, allowing much natural light into the space. Open floor plans are usually applied on houses with more limited spaces such as this one. You can see how it efficiently divides the limited space between the kitchen, dining and living areas, without sacrificing comfort and ease of movement. 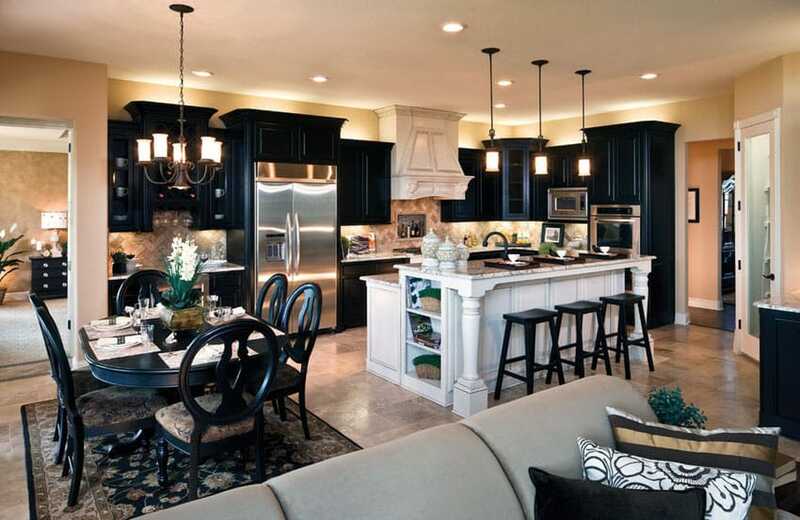 This design also exhibits excellent contrast, using a good balance of light and dark colors, such as the dark ebony kitchen cabinets combined with white kitchen island and solid wood ebony finish bar stools. Designs layouts with the kitchen and living area in the same room have become very popular for those who like to entertain, spend more time with family, or just keep an eye on small children. An open kitchen is great for someone who doesn’t want to cook alone or feel isolated during meal preparation. For even more ideas visit our page showcasing open kitchen designs with living room here. Another contemporary kitchen space adapting an open layout, making it look really spacious and airy. The kitchen cabinets are all matching, using solid teak wood for the cabinets and black granite for the counter top and backsplash. The bar stools used also matches the general color scheme of the kitchen, using black iron framing with upholstered seats. The use of stone cladding and classic silhouettes really gives this kitchen that authentic classic vibe. 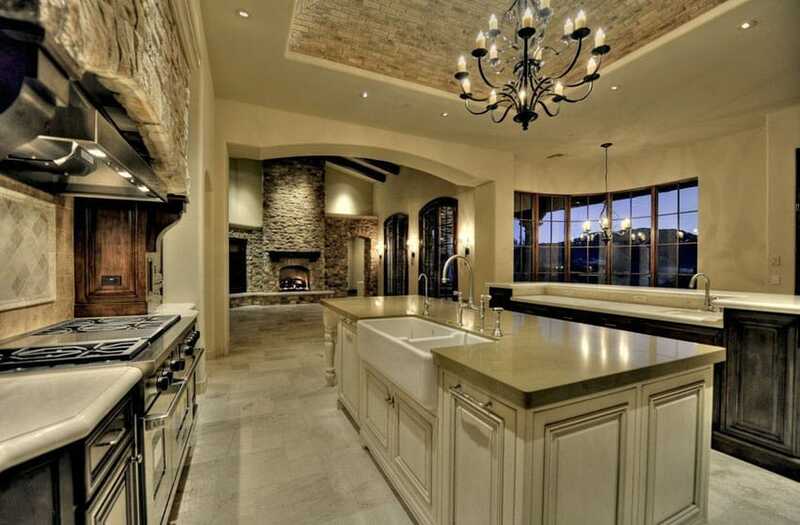 This luxury kitchen design is only semi-open, having direct access to the dining and living area via a large archway. The kitchen itself is composed of 3 parallel counters, 2 wall counters in weathered ash finish and one kitchen island in aged white finish. 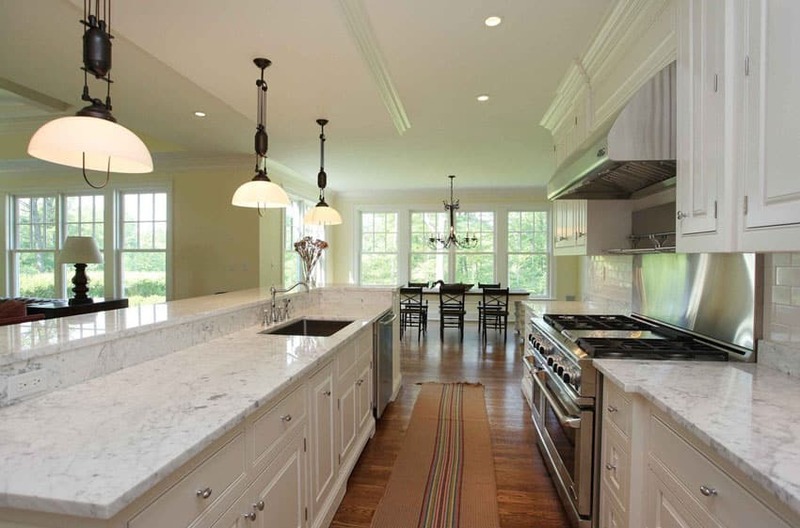 The main counters were topped with a thick slab of white quartz, while the kitchen island, uses beige quartz. A lovely open layout kitchen which directly connects the kitchen to the living and dining areas. The kitchen is a contemporary take on classic kitchen cabinet silhouettes, using traditional style with a more modern finishing. Main cabinets were painted in white and topped with flat-nosed marble for a more modern profile, and the large kitchen island goes for a solid teak wood finish with marble to to contrast with the white main cabinets. Right above it are 3 classic metal pendant lamps, and for the barstools, upholstered camelback was the chair of choice. 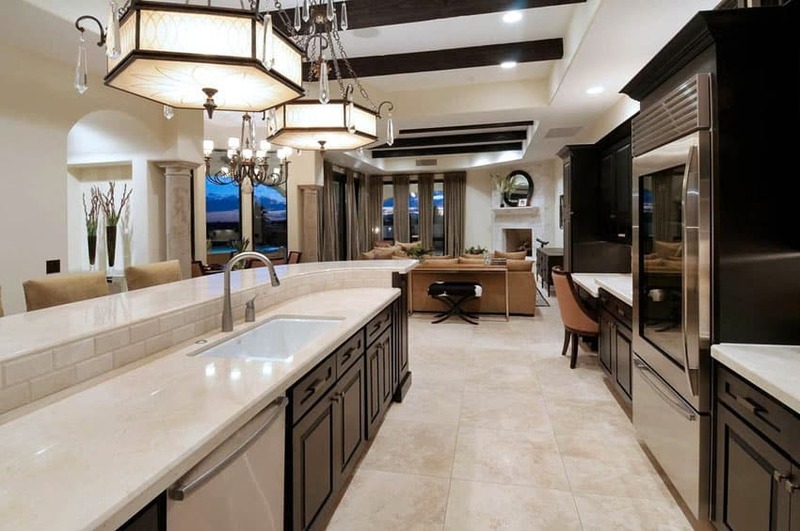 This massive open kitchen is unique as it is able to effectively delineate itself from the rest of the house, without resorting to partitions and walls, creating a big, open space. 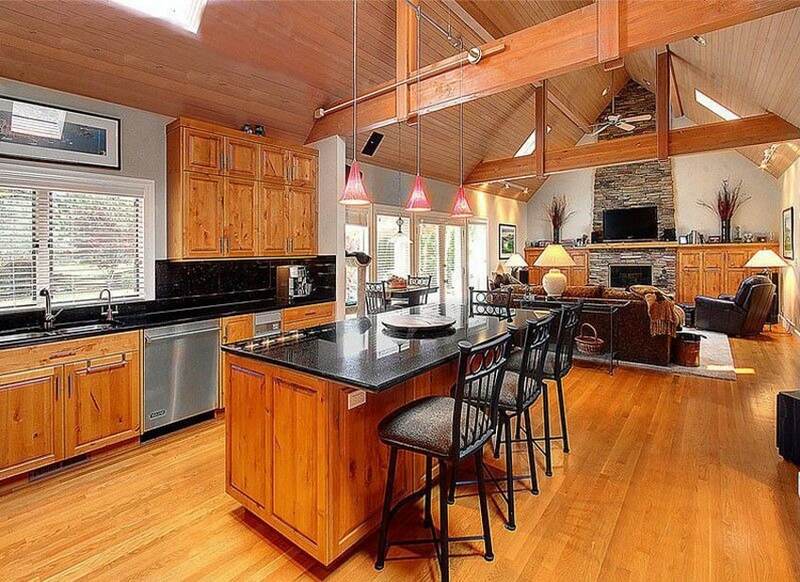 The only thing dividing the kitchen from the rest of the house is the corner kitchen/bar island. 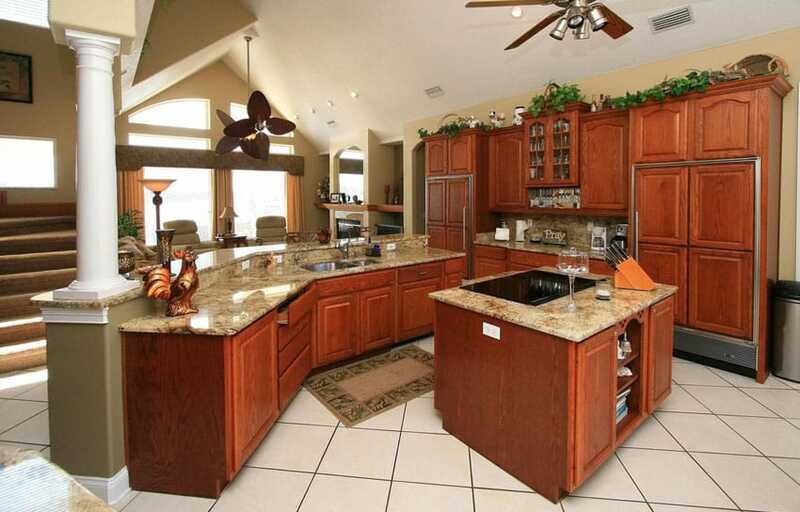 Style-wise, it uses classic walnut finished cabinets with beige sandstone counter top polished to perfection. Another transitional style kitchen adapting an open layout to help make it look more spacious and appealing. The kitchen cabinets adapts a contemporary take of classic paneled cabinets, topped with dark gray granite, creating a classic but effective combination of finishes. This also matches with the overall gray and white color scheme of the house. Not only does this house have high ceiling, it also adapts an open layout, creating a really airy and spacious looking interiors, perfect for those who love good open spaces. 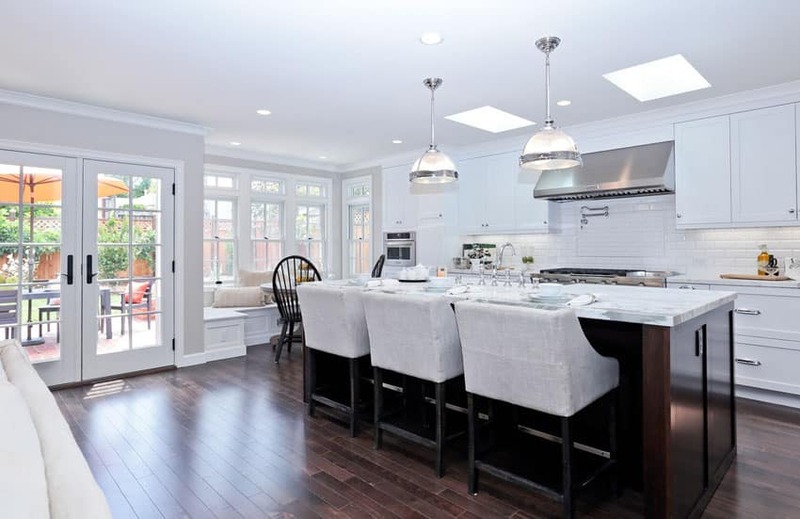 The space itself is of a traditional kitchen design, with a combination of white cabinets and gray countertop and stone backsplash for the main cabinets and dark mahogany finish of the island and breakfast table area. This country-inspired kitchen adapts a semi-open layout. It is separated from the living area via a very large archway, creating an unobstructed view and path to and from the kitchen. 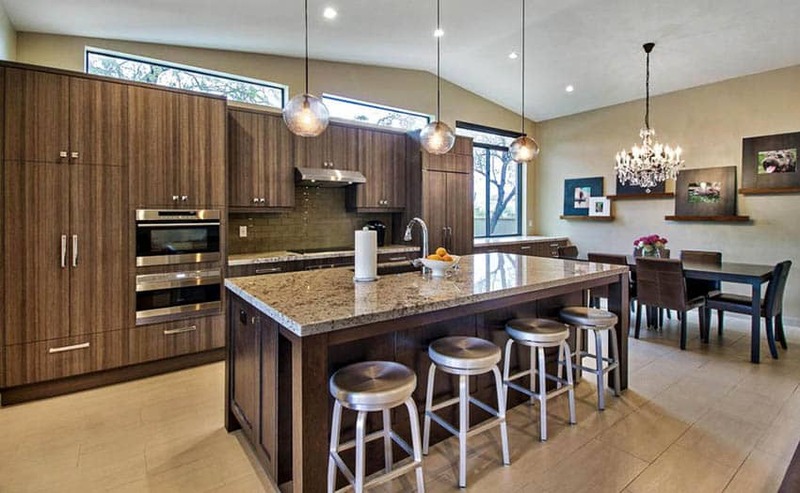 The cabinets used are golden teak, topped with round-nosed beige granite counters. As this space already has bold yellow gold walls, the kitchen cabinets goes for a more neutral & toned down feel, using modern panel cabinets in white topped with brown granite counters. The all-white cabinets helps balance out the bold yellows of the walls and the subtle orange of the floors, but at the same time, doesn’t completely stand out as its countertops still blend in with the yellows and oranges of the basic interior finishes. The smooth, dark walnut floors of this space set a sleek and elegant background perfect for this transitional style kitchen. The dark floors allow the all-white kitchen cabinets to really pop-out, creating a bright-looking space with a combination of white cabinets, white soapstone counters and white backsplash tiles. This is another all-white, neo-classic inspired kitchen design with an open layout, creating a bright and spacious look. All cabinets uses white finish with carrara marble countertop for an elegant finish, while the light cream marble flooring gives a soft warm color reflect to the kitchen, softening the stark white finish to a softer, warmer white. 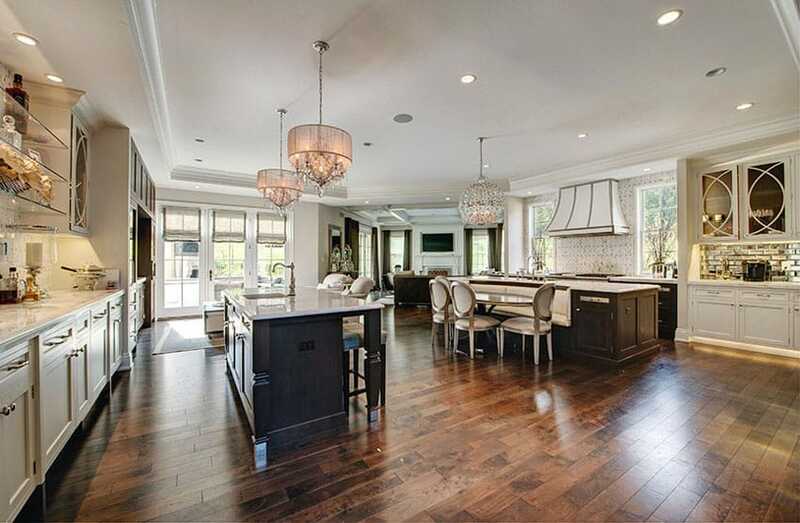 Open concept kitchens that open to the dining room such as the picture shown here can be ideal for entertaining. Dark ebony wood floors really sets and excellent base that makes this all-white kitchen pop out. The space has an open layout with high ceiling, creating a bright and airy space. The traditional style white kitchen with marble countertop is a classic beauty, making it look perfect whatever other style of furniture pieces you put into the space. 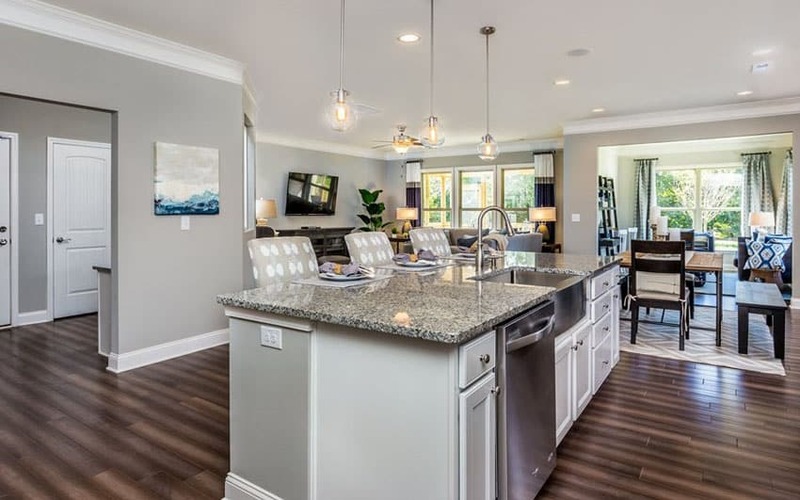 Open concept kitchens with islands equipped with large breakfast bars are great for families on the go, and for those who enjoy being part of the conversation while in the kitchen. This small modern kitchen has a unique dynamic layout which effectively separates the kitchen area from the other areas of the house, without totally blacking it out/separating it. The bar counter serves as the divider between the kitchen and the living area, providing a low and non-obstructive division between the two areas. 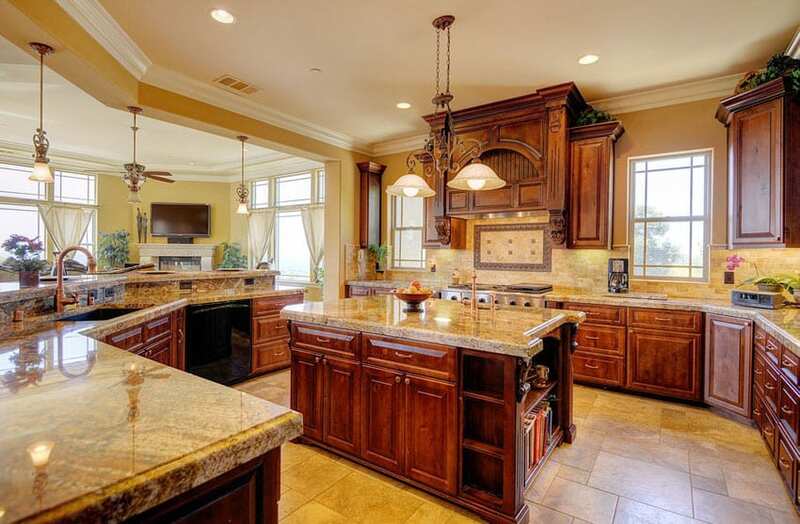 Simplicity and elegance definitely stands out with this traditional open style kitchen. The paneled cabinets are all finished in an off-white color for a clean and light look, white the counter top is a classic combination of white marble and white subway tiles. The timeless look of this kitchen can match any design style, be it modern or the more traditional looks, making an excellent design choice for your kitchen. This modern open concept kitchen is alluring with its large veneer cabinetry contrasting against beige granite countertops and tile flooring. 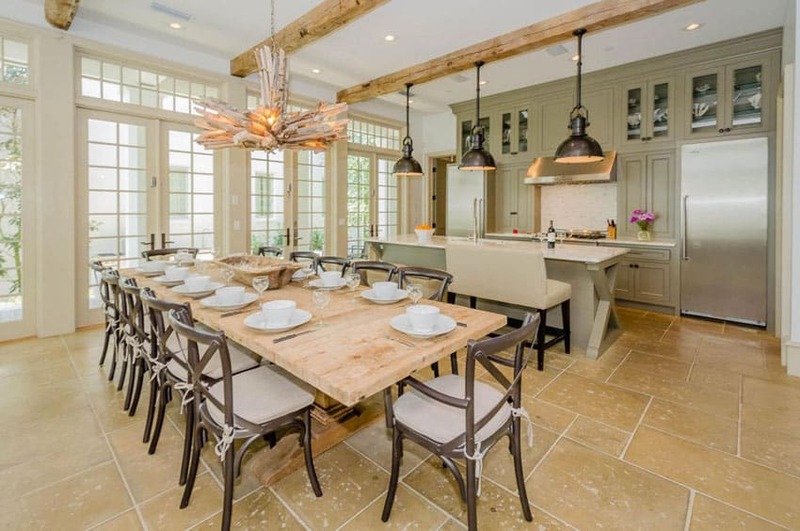 The transitional space opens up to a large dining area with plenty of natural light from an array of windows. A elegant chandelier brings a touch of traditional to this otherwise modern space. 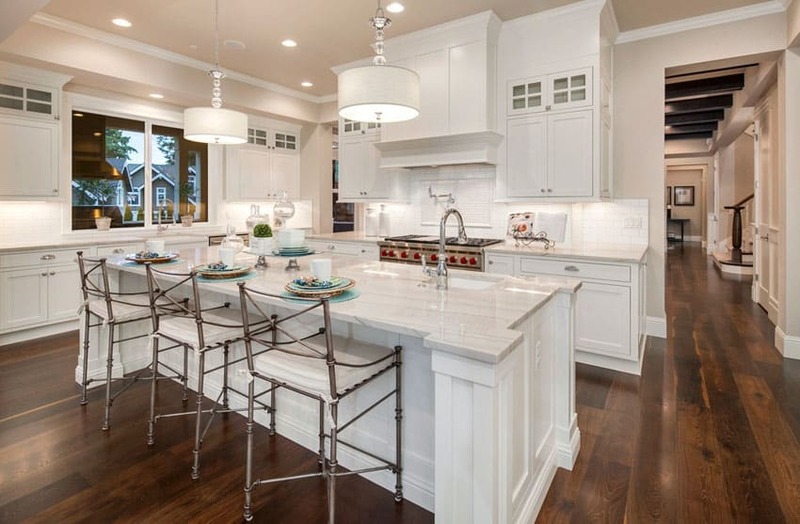 The large island with chrome bar stools provides further opportunity for eat-in dining or entertaining. 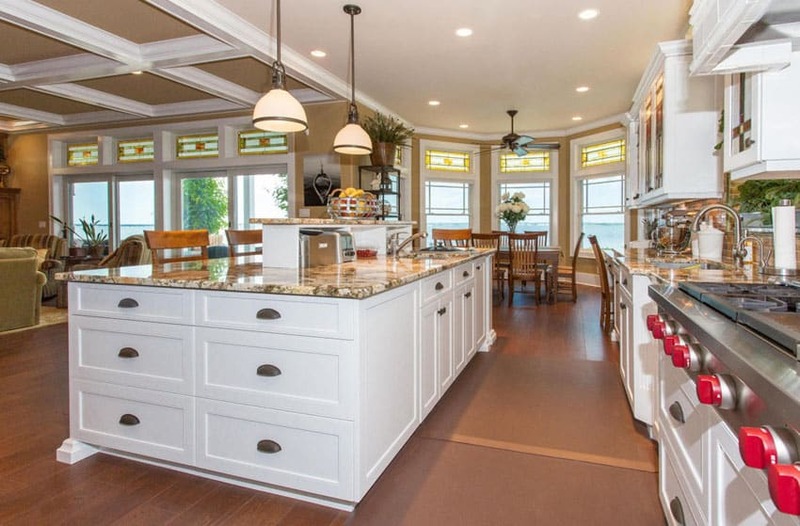 The open layout of this kitchen helps make it look more spacious. Due to the open layout, the design intends to stay well-coordinated with the rest of the space, using dark wengue finished cabinets to match with the other wood finishes in other parts of the house. To help tone it down, white counter tops were used, along with matching marble subway back splash tiles. Visit this page for more kitchen island ideas.